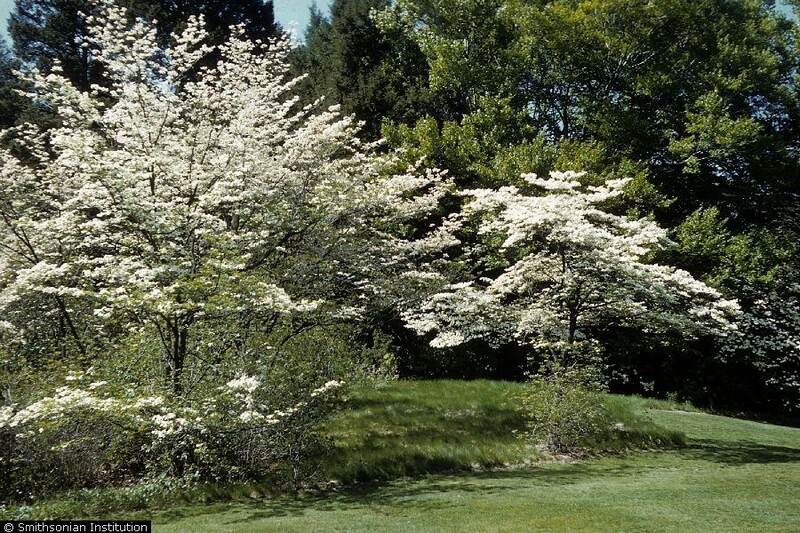 Cornus florida.R.A. Howard, Courtesy Smithsonian Institution.hosted by the USDA-NRCS PLANTS Database. (Accessed 9/2014). Cornus florida is an understory tree or large shrub, to about 10 m, also widely planted; shallow rooted; twigs bluish, often with a waxy bloom, older bark gray with small, square fissures; winter leaf buds with 2 scales meeting edge to edge (valvate), flower buds button-shaped, wider than tall with an abruptly pointed tip; leaf scars opposite; growth pattern determinate (Marks 1973; Gargiullo personal observation). Leaves opposite, egg-shaped, 6-10 cm long, about half as wide, tip long-pointed, pale below, margin untoothed, leaves expand late May after flowering; winter plant leafless 180 days (Britton 1874). Cornus florida. flowers.de.m.wikipedia.org (Accessed 5/20150. Flower bracts large, white, flowers small, yellowish; blooms May-June. Fruit red fleshy, about 1cm long, 1-seeded, ripens Sept.-Oct. Seed load 24%. Pulp nutrients: water 73%, lipid 24%, protein 7%, CHO 24% (White 1989). Seeds must overwinter to germinate. Fruit eaten and seeds dispersed by many birds, an important food for fall migrants. Frequency in New York City: Frequent. Habitat: Undisturbed moist forests and edges. Prefers moist, well-drained soil, pH 5.5-7. Very tolerant of shade, index 8-10. Cannot use more than 25% full sun for photosynthesis (saturation point) (Hicks and Chabot 1985). Intolerant of salt, soil compaction, and flooding (Hightshoe 1988). Notes: Susceptible to drought and fire damage, but stump sprouts easily. Twigs eaten by deer. Foliage and fruit high in calcium, C. florida leaf litter, which decays rapidly, may be important for retaining calcium levels in surface soils (Jenkins and White 2002). Recent high mortality from an Anthracnose fungus (Discula destructiva, Deuteromycotina, Coelomycetes) first reported in 1979 (Daughtrey 1998). Anthracnose is a general term for fungal diseases that cause necrotic or ulcerative lesions (Agrios 1988). 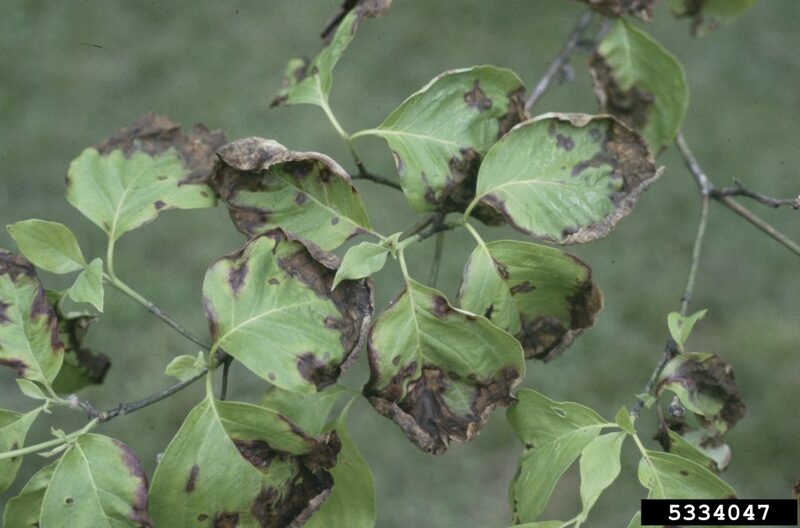 Discula infection often appears as purple rimmed lesions on dogwood leaves that spread into woody tissues and eventually kill the tree. It appears that smaller trees in more shaded, humid habitats are more susceptible than those in more open situations. Infection also decreases fruit production in larger trees. These two factors may eventually decrease the population because fewer trees are reaching reproductive size and overall reproduction is decreased. 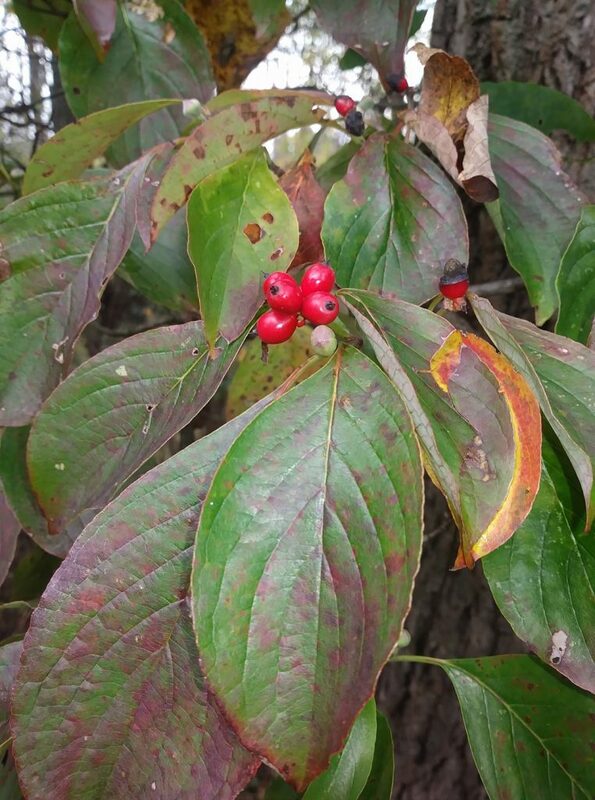 This pathogen may have been brought into the eastern United States on the Asian species Cornus kousa, which is relatively resistant; (Carr and Banas 2000; Jenkins and White 2002; Williams and Moriarity 1999). 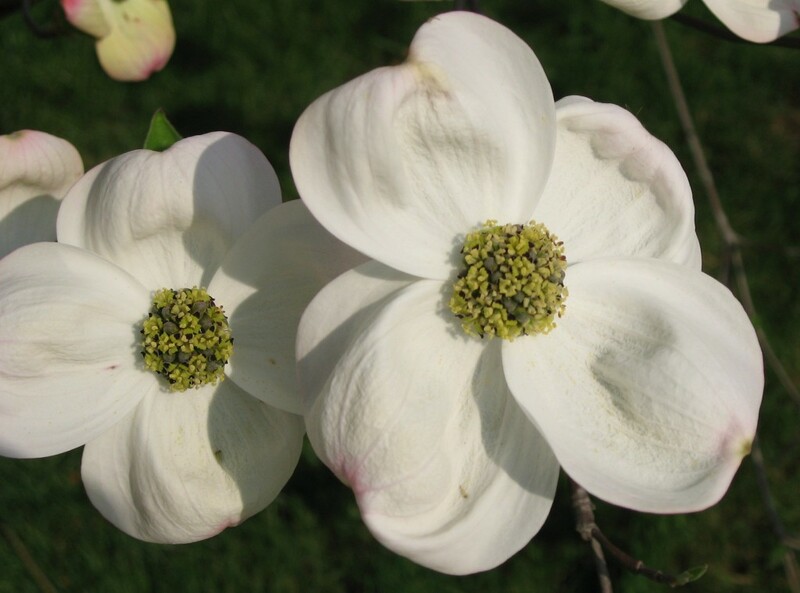 Leaves and flower bracts of flowering dogwood are often infected by spot anthracnose caused by Elsinoë corni (Ascomycotina). The lesions are reddish-purple with a tan center about 0.2 cm wide. Also attacked by basal stem canker (Phytophthora cactorum). Flowering dogwood is host to several types of borer including Synanthedon scitula. The larva of this wasp-like clearwing moth (family Sesiidae) enters the inner bark through a wound or scar and feeds on phloem and cambium. The dogwood twig borer, Oberea tripunctata, is the larva of a flat-faced long-horn beetle in the family Lamiinae. It bores along the pith of a twig from younger to older wood, killing the twig as it progresses. Probably because of its popularity as an ornamental, the pests and diseases of flowering dog have been well cataloged and are numerous. Although many are not life-threatening. Many appear to do more damage to cultivated than to wild trees (Agrios 1988; Burns and Honkala 1990; Covell 1984; Johnson and Lyon 1991; Sinclair et al. 1987; White 1983).